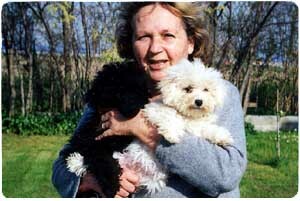 My career as a dog breeder began by chance. I was looking for a puppy and I had no idea what sort of breed it should be. My son Gianpaolo helped me during my search and, to tell the truth, he was the one who chose the dog: white, small, and as I was told, a Bolognese. I immediately fell in love with the dog’s temperament more than with his beauty and I always brought him with me wherever I went. After taking part in a dog show, I realized that my dog wasn’t a typical example of the Bolognese breed: his coat was not very “curly”, his muzzle was slightly long, etc. 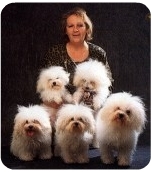 I began taking interest and studying this breed, and became passionately keen on Bolognese dogs, which today I call “small children with fur”. My interest was rewarded because luck brought me Carlotta: a very beautiful and sweet female Bolognese, and a male, Eliseo, just as beautiful and with a great character. This adventure of mine began with them. 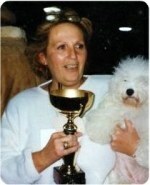 The many Italian, European and world prizes I have won have not only given me great satisfaction and recognition but also and especially the stimulus and effort needed to continue breeding the beautiful dogs of this wonderful Bolognese breed.